Aw, can’t you just imagine that soft fur against your face? 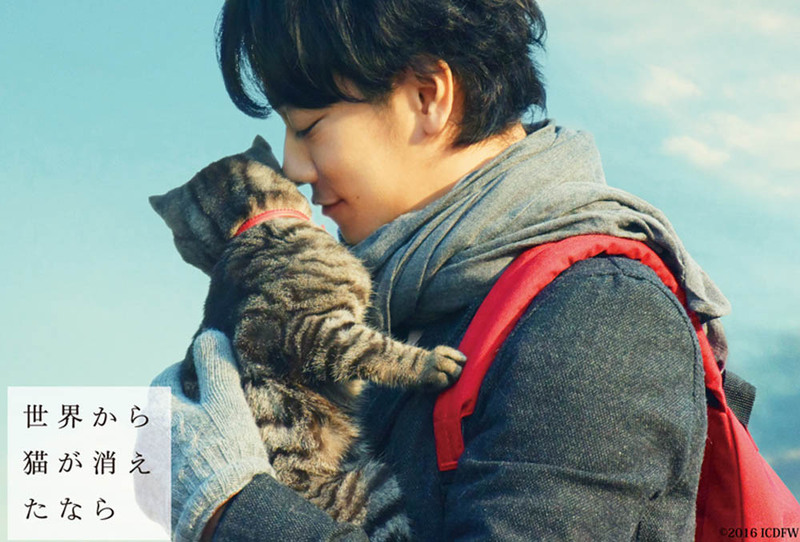 Takeru Satoh is the main human star of the Japanese film If Cats Disappeared From the World. If Cats Disappeared from the World? Noooo! That’s a very distressing thought! But the Japanese film that carries that title is nothing short of magical. Everything works. The script is based on a best selling book, Sekai kara Neko ga Kieta nara by Genki Kawamura. Takeru Satoh, the star of the live action Rurouni Kenshin trilogy, is excellent as the main character. He’s a handsome guy with big eyes, but I bet some special lighting was used to make him look extra luminous here. Satoh plays a 30-year-old postman (he’s really 27 and he looks younger) who has been living from one day to the next without thinking too much about the future. After a tumble from his bicycle, his doctor tells him that he has an inoperable brain tumour and he could die any day. Then a guy who isn’t Death, but might be the Devil, shows up and tells the postman that he will die tomorrow, unless he’s interested in a deal. No contracts signed in blood or anything like that, though. Every day from now on the Devil will make some useless thing (in his cranky opinion) totally vanish from this world – how about starting with telephones? – and as long as the postman agrees, he can have one more day of life. Don’t worry if that sounds weird, silly or stupid, it’s just a way to show us flashbacks and to get the postman and the audience thinking about memories, the things that are truly important to us, the totally random way we might have met someone who became a lifelong friend, and how much films, (and cats!) enrich our lives. In the film If Cats Disappeared From the World, the postman (Takeru Satoh) and his girlfriend (Aoi Miyazaki) would talk to each other on the phone so late into the night that when they went out on dates together they couldn’t stay awake. If Cats Disappeared from the World could easily have turned out corny, or sickeningly sweet, but no one made a misstep. We were promised tears but I managed to hold mine in, just barely.The one and only screening at the Fantasia International Film Festival in Montreal was sold out and everyone there applauded heartily when the film was over. A few sniffles were heard. If you get a chance to see If Cats Disappeared from the World you should leap at it, and grab it with your paws and claws! If Cats Disappeared from the World, directed by Akira Nagai, written by Genki Kawamura. With Takeru Satoh, Aoi Miyazaki, Gaku Hamada, Eiji Okuda and Mieko Harada. BTW: Takeru Satoh can also be seen in Bakuman, a film about two high school students (told you he looked young!) who write a manga. It’s very entertaining. You can watch Bakuman at Fantasia at 6:40 p.m. on Saturday, July 30, 2016 in the Hall Theatre, 1455 de Maisonneuve Blvd. W. Read more about Bakuman on the Fantasia web site. Fantasia continues until Wednesday, August 3, 2016. Next Post Fantasia 2016 presents TWO Zappin’ Parties from DJ XL5!